Minutes after the St. Louis Cardinals coughed up a lead and lost on July 14 to the Cincinnati Reds to drop to 47-46, manager Mike Matheny said they had a good run in them. Turns out Matheny was right. But that good run wasn’t with him in the dugout. Management fired Matheny just a few minutes following his postgame prediction, installing Mike Shildt as the interim manager. Since then, St. Louis (87-69) has gone 40-23, earning Shildt the permanent manager’s job and propelling itself into position to return to the postseason for the first time in three years. The Cardinals start their last home series of the year Monday night against one of the teams they’re trying to catch, the Milwaukee Brewers (89-67). They currently reside two games ahead of St. Louis for the National League’s first wild card after each team won in blowout fashion Sunday. Sunday’s victory over San Francisco, which completed a weekend sweep, was a good representation of St. Louis’ recent focus. Instead of looking ahead to their showdown with Milwaukee, the Cardinals instead played a crisp game. Mikolas gave up just two hits and one earned run over seven shutdown innings. St. Louis blew it open with a five-run seventh that included two perfect pieces of baseball — a perfectly-executed safety squeeze by Harrison Bader and a lovely hit-and-run single by Jairo Munoz that scored the running Yadier Molina from second. The Cardinals have juggled their rotation to lead off the series with rookie right-hander Jack Flaherty (8-8, 3.08), who has dominated the Brewers in three starts this year. Flaherty is 1-0 with a 1.00 earned run average, fanning 29 batters in 18 innings and only allowing a .161 average. But since a 5-2 win Aug. 28 over Pittsburgh, Flaherty is winless in his last four starts, including a 7-3 setback Wednesday in Atlanta. He permitted five hits and five runs in 4 2/3 innings, walking two and whiffing six. Chase Anderson (9-8, 3.93) was scheduled to start for Milwaukee, but manager Craig Counsell scratched him about 30 minutes after a 13-6 triumph Sunday in Pittsburgh. 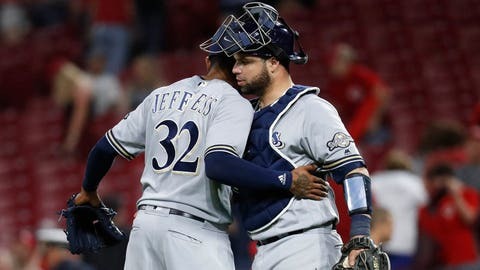 The Brewers will now use their bullpen, but hadn’t designated an “opener” as of early Sunday night. Regardless of what combination of pitchers Milwaukee uses, Counsell says they won’t change their approach just because it’s a big series.